I joined group of bird watchers who visited the Arfak mountains, 1–6 June 2012, to see species of Bird of Paradise and the Vogelkop Bower Bird in the wild. BAKOSURTANAL (Indonesian Mapping Agency – BAKO) maps of this region are at 1:250,000 – sufficient for an overview of the terrain but less useful for orienteering. 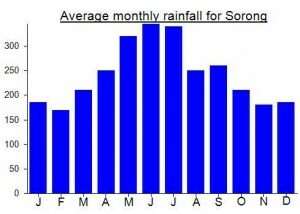 The driest month are apparently June and October; we had heavy rain most late afternoons. I climbed to a ‘high point’ on the ‘Arfak’ (see note 1 below) range, SW of Desa (village) Mokwam, from where excellent views in all directions are possible. Note two below provides some information about the Arfak mountains with view to trekking in the region. It discusses, but does not completely resolve, the mystery of where Gunung Umsini is located. From Manokwari, we drove to Kecamatan (sub-district) Prafi from where a sealed road leads South into the mountains to Desa Mokwam (GPS: S010 06.56’, E1330 54.61’). The road ascends along several ridges and over two fast-flowing rivers. Mokwam has been made famous by David Attenborough’s filming of Birds of Paradise and the Vogelkop Bower Bird (see note 3 below). The Mokwam villagers are aware that they possess a highly valuable natural resource, namely several species of Birds of Paradise and Vogelkop Bowerbird, for which ornithologists are willing to pay highly to see in the wild. This entrepreneurial attitude bodes well for conservation. A Mokwam villager is endeavouring to open a centre at Ciraubrig on the western slopes of G. Umsini (see below) where, he informs, Birds of Paradise as well as Cuscus and Tree Kangaroos can be seen. This site is a 3-4 day (return) camping trek from Mokwam. Beyond to the Anggi lakes and Ransiki: About 4 kms before Mokwam, the main road branches to the right (SSW). Opened in about 2009, it passes over the ‘Arfak’ range and reaches the two Anggi lakes (about 2,000 m ASL), Gigi, the ‘male’ and Gita, the ‘female’. The road then continues SE to Ransiki on the coast and back to Manokwari along the coast to the north. With the opening of this road, the Arfak mountains have become much more accessible. We did not travel this road beyond Mokwam so cannot vouch for its condition. I had difficulties reconciling topo information on the BAKO maps with local knowledge. Communities within the Arfak mountains lived, until recently, in isolated valleys and speak some five separate languages. Also, they are highly territorial; for example, I was advised that it is not possible to climb G. Mebo from the Mokwam side because it is ‘beyond our territory’. Information, such as names of villages, rivers, peaks, etc., that villagers provided, was often inconsistent with that on the BAKO maps. Trekking in the Arfaks, as in much of Papua, is largely dependent upon the existence of traditional tracks (‘highways’) linking villages over ranges in neighbouring valleys. The alternative is to cut one’s own tracks, which could be a formidable task as most trekking would be below about 2500 m where forest predominates. Since the construction of a road through the mountains, some of these traditional tracks are no longer used and are becoming overgrown. Gunung Mebo: this peak lies to the SSE of Mokwam and West of Warkopi on the coast. Mokwam villagers did not recognise the name ‘Mebo’ even though it is clearly visible from their village. They informed that the peak should be approached from the Warkopi side (because it is ‘beyond our territory’); but also presumably, and more practically, because there are no traditional tracks over the mountain from the Mokwam side. From the BAKO map, the Warkopi approach, about 15-20 kms, seems preferable. Enquires need to be made at Warkopi whether a track exists from that side but I suspect not. Gunung Gombian: this peak lies on the southern end of a range that the Mokwam people know as ‘Arfak’. They did not recognise the name ‘Gombian’ but suggested that it might be ‘Gombiou’ or ‘Mombiou’, in their language. The BAKO map names another range as ‘Arfak’ but the two ranges meet at G. Gombian so the name, ‘Arfak’, should not be taken too literally or exclusively for any one range in the region. I climbed Pg. ‘Arfak’ and reached a high point that the Mokwam villagers know as ‘Puncak (peak) Arfak’ (GPS: 2,621 m; S01008.53’ E133054.59’). This point is not really a peak but simply a ‘high point’ on the range with great views. This was an ‘easy stroll’ from a comfortable base camp in a saddle (good water) at 2153 m, known as ‘Japanese Camp’, the site of an earlier Japanese ornithological expedition. G. Gombian lies further along the ‘Arfak’ range, about 5 kms SSE of ‘Puncak Arfak’. Unfortunately, there was heavy cloud to the south at the time and I was not able to see G. Gombian or the Anggi lakes to the SSW. The traditional track from Mokwam over the ‘Arfak’ range to the valley to the West descends from ‘Puncak Arfak’ to Desa Benti near ‘Menyamboe’ (possibly Mintjatobori or Manjewi on the BAKO map). Since the construction of the road through the mountains to the Anggi lakes, this track is no longer used and is becoming overgrown. A traditional track does not extend from ‘Puncak Arfak’ to G. Gombian. A track would need to be cut but, as the range is mostly above 2500 m at this point, the undergrowth is not too dense. An alternative, to be explored, would be to start from Desa Andang (as per BAKO map, at about 2500 m) at the SSW foot of G. Gombian but it is almost certain that a traditional track does not exist. Pengunungan Lina: this range has the third highest peak in the Arfaks. Pg. Lina is some 13 kms SW of Anggi Gigi lake and lies in a NW-SE direction. The BAKO map suggests that its NE and SE faces are very steep; the peak should probably be approached from the NW end with base camp in a village on the southern end of Anggi Gigi lake. The mystery of Gunung Umsini: G. Umsini seems to have acquired some renown in websites, maps, travellers’ tales, etc. but I am yet to understand why. Some maps and websites attribute the name, G. Umsini, to the highest point on Pg. Lina, which at face value is simply wrong. The Gunung Bagging website locates G. Umsini but, from the altitude and coordinates given, is in fact G. Mebo as per the BAKO map. 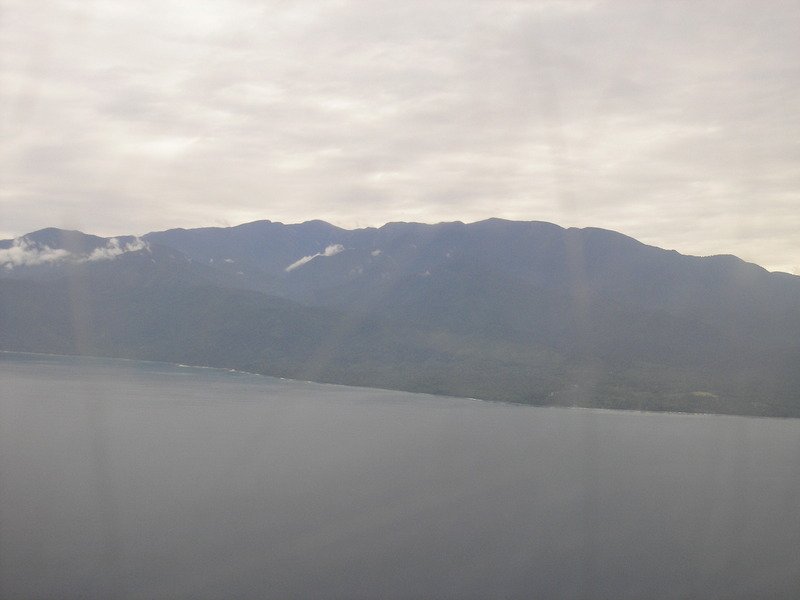 The people of Manokwari and the Mokwam villagers attribute the name, G. Umsini, to a ‘high point’ overlooking Manokwari that is clearly visible from both Manokwari (to the SSW) and Desa Mokwam (to the NE). This ‘high point’ is on the range running north from G. Mebo. From Manokwari, the top of another, higher peak, almost certainly G. Mebo, can be seen beyond. The BAKO map does not show the name ‘G. Umsini’ anywhere but there is a reference to a ‘G. Utjina’ (to the NW of G. Beriba), which could be a misspelling of ‘Umsini’. G. Beriba (BAKO: 2533 m; approx. S010 6’, E1330 59′) lies on the main range about 7 kms N of G. Mebo and is most likely to be G. Umsini. The Mokwam villagers informed that it is possible to ascend from the bird-watching centre at Ciraubrig (above) to G. Umsini and, from there, descend north along the main range to Warmare on the main road between Manokwari and Prafi. The massif in the centre of the Arfak mountains: numerous high points between 2500 and 2700 m. The BAKO map does not record any villages in this region so it is unlikely that any traditional tracks exist. An expedition to this region could be a major, but highly rewarding, undertaking. G. Mebo and G. Umsini: starting at Warkopi on the east coast, ascend to G. Mebo (2916 m); then descend along the range to Warmare via G. Beriba (which could be G. Umsini). Desa Mokwam in the valley to the east. Pegunungan Lina: reach the villages on the southern end of Anggi Gigi lake by either the coast road to Ransiki, or the inland road through the mountains, or as a continuation of a G. Mebo/ Gombian trek. From there, trek about 13 kms to the NW end of the Pg. Lina and, then, along the range in a SE direction to its highest point. The Arfaks have great potential for trekking but more information is needed on the existence of traditional tracks over the ranges. The confusion over the names of peaks, villages and rivers, on the BAKO map, ultimately does not matter (although it does make writing a note such as this complicated and confusing). My advice is to identify the topo features using local knowledge and names wherever possible. In this manner, it is much easier to communicate with the local people who, ultimately, know their territory intimately and will act as guides. With regards to the location of G. Umsini, again it really does not matter – what’s in a name in any case? My suggestion is adopt the ‘high point’ that the Manokwari people and Mokwam villagers know as G. Umsini. 1. At least, two different ranges are referred to as the ‘Arfak’ range locally, hence parentheses. 4. 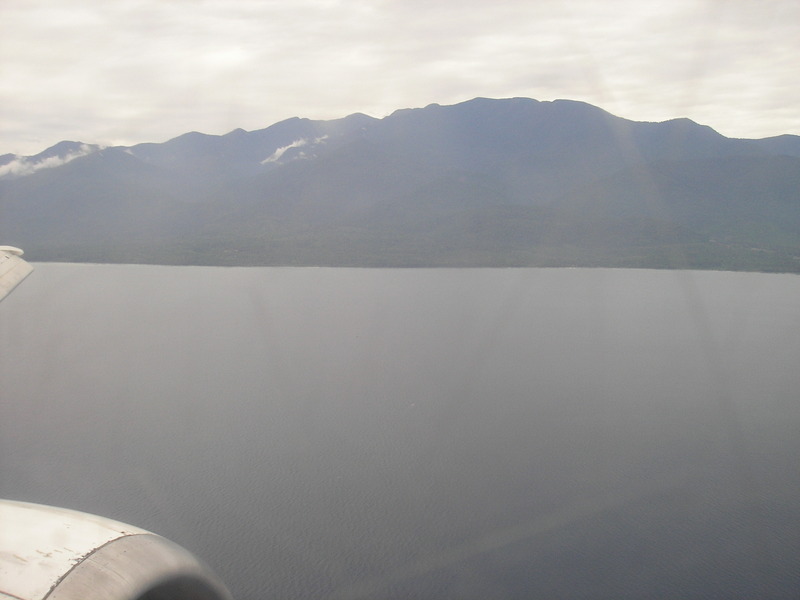 The Vogelkop is geologically independent of the main island of New Guinea. See The Ecology of Indonesia Series, Volume VI, The Ecology of Papua, 2.1, Tectonic Geology of Papua, Periplus, Hong Kong, 2007. Getting there: Manokwari is the closest airport.